The unique combination of comfort, luxury and relaxation! This holiday home is the perfect place for those who love comfort and wellness. 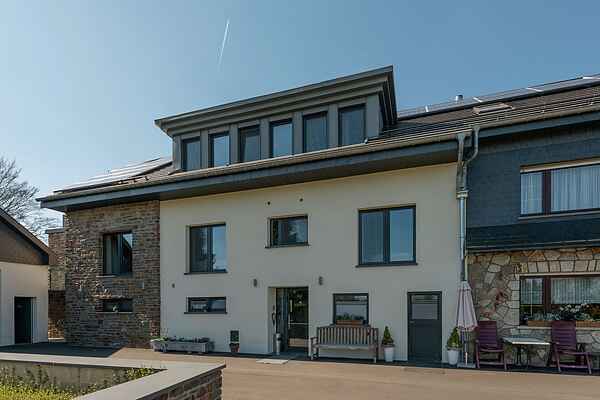 You will find this holiday home at just five kilometres from the lake of Bütgenbach. The fully renovated house is equipped with all luxuries and comforts. The decor is stylish and the beautiful fireplace in the living room add to the atmosphere. In the characteristic wooden kitchen you can cook delicious meals; for example, you could grill a piece of meat or vegetables on the teppanyaki grill. After a day out you can retire to the sauna and Jacuzzi. Or perhaps you'd rather drink a nice Ardennes beer at the bar in the relaxation area. In the evening you can sit outside until the small hours on the partially covered patio, while the outdoor fireplace creates the necessary heat. This holiday home is aimed at families. For your daily shopping, you can go to Bütgenbach (5 km). Water sports enthusiasts can indulge in the lakes of Bütgenbach and Robertville (16 km). You can go kayaking, swimming, sailing, windsurfing or try the pedalos. The area also features marked hiking and biking trails. Skiing possibilities can be found in Ovifat (17 km).